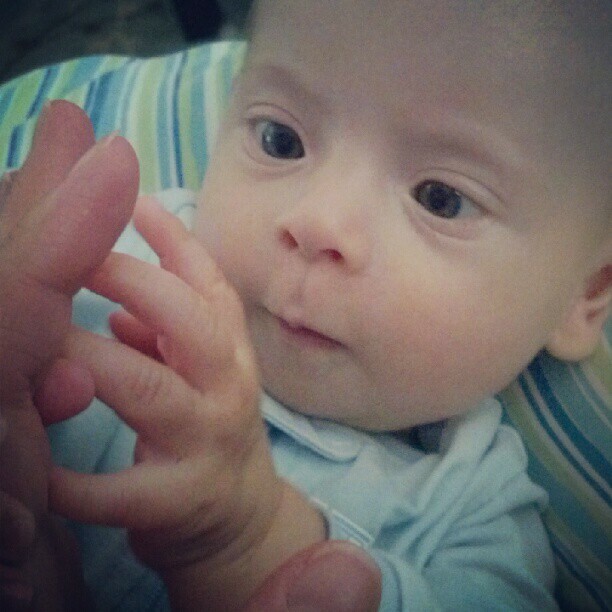 The look on a baby's face when he becomes aware of his fingers never ceases to amaze me. The slow motion of curling and uncurling them into his palm. The intense gaze as one hand grasps the other. Fingers are like a baby's first toy, a very valuable toy. 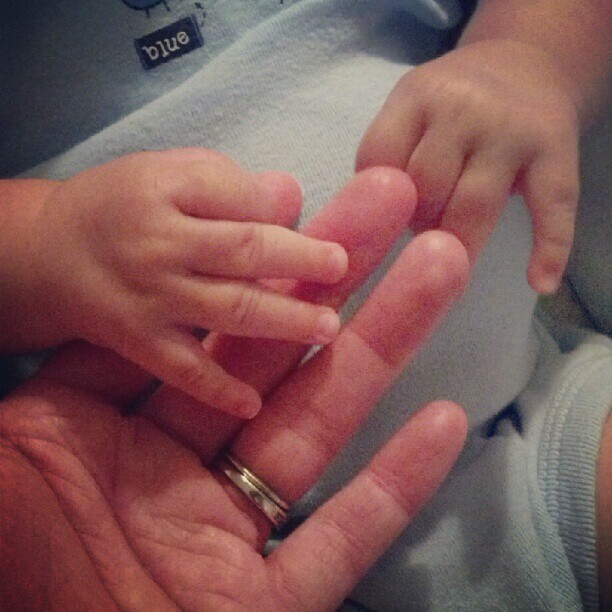 As simple as they may seem to me as an adult, fingers are a wealth of knowledge and play for a baby. He will eventually learn that fingers and hands can do amazing things for him. Just a wiggle and a wave will capture his attention. He watches how they move, fast and slow, with grace or not, noticing they are the same, but different from mine. He listens to the sounds made by what they touch. He reaches out and feels when they bend and flex to hold an object, and the pressure used to grab on. He notices the way they taste and smell when they are pulled into his mouth for comfort and texture exploration. ...and much more. He is fascinated by what his own fingers can do everyday, the way they let him play. The simple act of letting a baby hold and touch your fingers as you work and play is a connection their brains will make, and lead to more deliberate movements to obtain objects of desire. Toys, writing utensils, tools. We also use finger plays. Our favorites are classics like; The Itsy Bitsy Spider, Where is Thumbkin? This Little Piggy Went to Market, and Five Little Ducks. They increase early eye-hand coordination, fine motor, gross motor, and memory and language skills. What finger plays or games are you using to engage your baby? V cute photos. 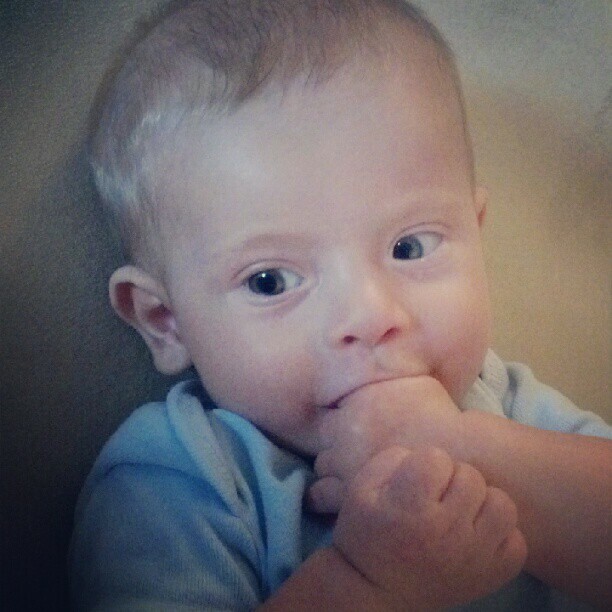 I love playing finger games with my 5 month old. We like 1, 2, 3,4,5 once I caught a fish alive and 1 finger, 1 thumb keep moving best. He is fascinated by his own hands and likes playing with mine. I love this stage. I can never get enough of the fascinated look he gets on his face! These are great ideas for early learning and play. Please link this post to Artsy Play Wednesday on Capri + 3 (a weekly linky for arts, crafts and play posts). 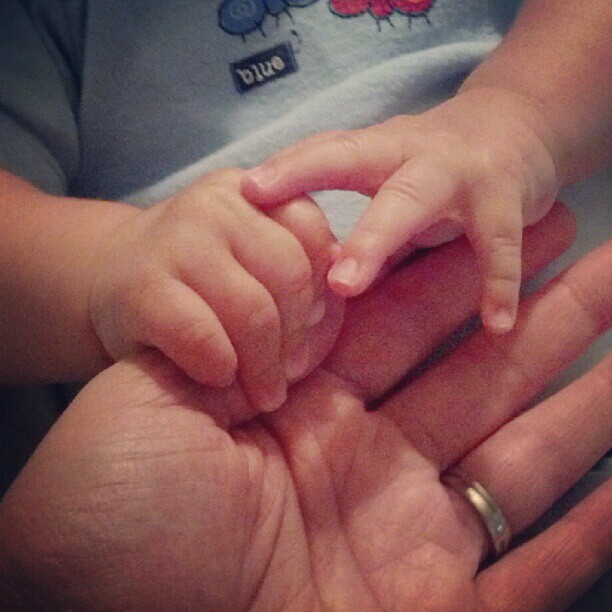 There's just something about the feeling you get when a little one grabs your fingers or hands - talk about melting. :) Thanks for sharing at the Sunday Showcase! Finger plays have almost become a lost "art!"